Getting kids interested in sports and fitness at a young age puts them on a good path for later in life. Staying fit and lean is important for overall health, plus competition can help to teach them how to be gracious whether they win or lose. If you want to keep it fun and keep kids active, here are a few sporting activities to get kids up and moving. Maybe you’re planning for a community event, or for a child’s birthday party? Throwing a sports day event is a great option. Running, skipping races and relay are all solid sports day activities- great for getting kids up and moving about. But be sure to add in a few fun and silly races too to break up the day. Three legged race, egg and spoon race and sack races are all fantastic ones to consider for a few laughs. Don’t forget plenty of prizes, you could even have custom medals made up and present them after the event. To rev up the competitiveness and for even more fun, how about signing them up a team sport? It could be something casual like a game of football at the park, most recreational areas also have basketball courts. Alternatively you look for classes at sports centres. Cricket, hockey, even water polo are good choices. Again having prizes for the winners will make everyone work that bit harder, plus it’s an opportunity for kids to socialise and mix with others their age too. Trampolining is so much fun it hardly feels like exercise. Yet it’s an incredible cardiovascular workout. Plus it helps to tone and strengthen muscles, as well as teaching kids balance and control. 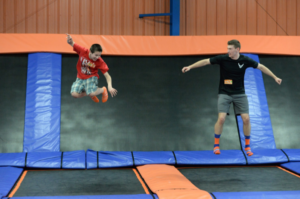 There are trampoline parks dotted around all over the place, these have things like foam pits and other fun things to do too which all burn through kids never ending energy. Plus they’re positioned in a way that it’s impossible to fall from the trampoline so no spotters are needed. On the other hand, you could always see what lessons are available for their age group local to you. Ice skating is a lot of fun, and improves balance. It also tones the legs and gives the heart and lungs a workout too. Ice skating is something you can do with all the family, it’s a real treat for kids and is great exercise without it feeling like it at all. 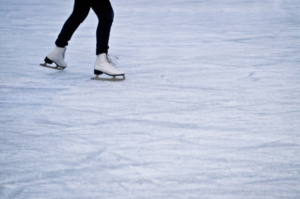 For tweens and teens, many ice skating rinks have disco evenings which again is a chance to socialise as well as get some exercise in. If you want the competitive element, book them in for ice skating lessons. Competitions in this sport are about as cut throat as it gets, and can teach a lot of patience and self discipline. What do you think the best sporting activities are to get kids away from their screens, and up exercising?